We were only able to spend a very limited time in Australia. It is such a beautiful and intriguing country that it only left us wanting more. All the hopes I had for our Sydney area trip were realized and surpassed leaving us with a huge bucket list of locations to see when we return. One of our goals is to take a full year camping around the entire country. It's a lofty and expensive goal but one that I research often none the less. As I was researching this option however I came across the time saving option of cruising. It is also expensive, by our standards, but it can be a great way to see loads of the country while at the same time saving all that in between transit time that a road trip would eat up. There are loads and loads of options that you can discover with OzCruising, but these 5 Australian cruises are the best ones to add to any bucket list, in my humble opinion anyway. Where it goes: Most of the cruises start in Sydney, which is quite convenient since in my experience flights in and out of Australia are cheapest and offer the most frequency going into Sydney. This cruise starts there, heads over to Tasmania and also ports in Adelaide and Melbourne before stopping on the other side of Tasmania as it returns to Sydney. Why I love it: Tasmania is very high already on my list of Australian spots to visit. Since it is an island you already need to either take a boat or fly to get there, this cruise porting in 2 locations saves loads of time and probably a fair bit of money. It is a nature lovers paradise! In Melbourne you can discover and enjoy the 12 apostles on the great ocean rd, see wild penguins on Phillip island, shop the queens markets, and enjoy the city life. Where it goes: Again this cruise originates in Sydney, then heads towards Cairns stopping along the way in Newcastle, and the famous Whitsunday islands. Why I love it: The easiest answer is all things ocean, which happens to be where most of my family feels most at peace! This cruise will take you through some of the most beautiful spots on the planet, most of them water related. Cairns is where the Great Barrier Reef is so you can enjoy stunning underwater scenery, whether you dive or snorkel, on the worlds largest living reef. 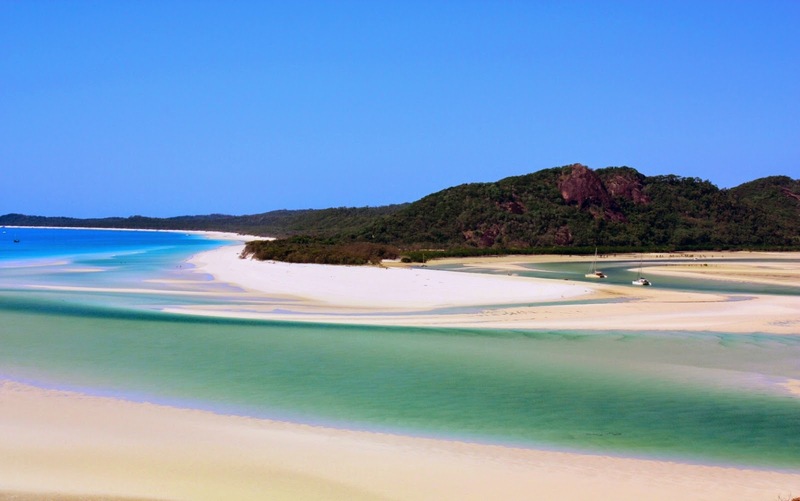 The Whitsunday islands offer perhaps the most beautiful beaches I have ever seen, in photos of course, but wow. I mean just look at that photo!! It is also an expensive spot to visit from land and one many people pass over. This cruise assures you will get to see the best ocean life Australia has to offer! Where it goes: Once more this cruise will start you out in Sydney and head directly to Moreton island and back. It is a relatively short cruise at just 4 days so may be a good intro if you are new to Oz or cruising in general. Why I love it: Moreton Island was never on any of my must see lists for Australia, it seems to get passed over for some of the bigger sites but I can assure you this is a gem of a spot and one you should consider strongly. The island is located in Brisbane and is the 3rd largest sand island in the world. Here you will be able to relax on one of the islands many beautiful beaches, dive among mysterious wrecks, hand feed wild dolphins or swim in one of the crystal clear lakes or lagoons. Where it goes: Originating in Sydney harbor, this cruise has many variations on spots to stop such as Melbourne and Adelaide but ends up in Perth. Why I love it: Personally I have a huge interest in Perth as a lot of friends hail from the area and from what I have heard and observed through various blogs, it seems to be a wonderful child friendly city as well as a great jumping off point for wine country as well as Ningaloo, where you can swim with whale sharks amongst other amazing aquatic life. Where it goes: A better title would be where doesn't it go? This cruise is the all in one cruise that offers you nearly the whole of Australia. It starts in Sydney and circumnavigates the entire continent making stops in all the most highly desired ports; Hobart, Melbourne, Adelaide, Fremantle, Darwin, Cairns, and Brisbane, with a few other stops along the way. Some of the cruises even include Bali and/or New Zealand in the route on the way back to the starting port of Sydney. Why I love it: Easy, you get to see not only the best Australia has to offer but nearly all of it. I had no idea this was even an option before but at the end of this article I am realizing that a cruise may be an even better route to go than a road trip. This particular cruise will take you to all the biggest cities, all the most beautiful beaches, and give you a really good sampling of Australia from a view most never have! That's it, we are cruisng it! How about you? Had you ever considered a cruise as a means to explore the land down under? Oh wow, i'd love to do that. Enjoyed a pink sand beach in Bermuda and had no idea there was one in Indonesia! Wow!! Those are incredible shots. I was in Oahu when there was a tsunami alert in 2010. Happily there was no damage as a result but it was still a powerful reminder of Mother Nature's strength. As a Native Floridian, I have experienced several hurricanes. So sad to see the destruction in Hawaii, but as always Mother Nature and human resilience will prevail in time. As one who lived in the Philippines for 54 years, I know about hurricanes. I am glad you are all well. This post has shred away my naivety in thinking that I am immune to natural disasters when abroad. Stunning shots that really had me thinking, questioning Mother Nature. This just shows how strong the power of nature is. Your photos are not so foreign to me since in the Philippines, we get a lot of string typhoons. Anyhow, you really captured the aftermath well. I hope everyone keeps safe! We are New Yorkers, and we are often viewed as an apathetic sub-culture, and it may be true to a certain degree; but the city and its inhabitants always tend to show the better side of themselves when faced with tragedy. It was never so apparent in my lifetime than during Hurricane Sandy, and of course 9/11. Wow. Fantastic photo progression of the storm. I absolutely love the strength of community you captured so well in your photo. While it's easy for me to sit back and comment on how stunningly surreal/ dramatic those photographs are, I can't even begin to imagine what you would have gone through. Hurricanes are no joke! I was born and raised in Miami so I've been through a lot of hurricanes. The worst was Hurricane Andrew in 1992. I'm glad no one in your family was hurt. Living in Coastal Virginia I am all too familiar with the havoc hurricanes can bring. I'm happy to see your community rallied to come back, it really does restore your faith doesn't it? So scary! We have monthly tests for the tsunami alerts since I live 1/2 mile from the ocean and they scare me every time:) It was a really cool experience but one i'd prefer not to repeat, so much damage! Oh I bet you are familiar with it! It was our first time and I am still floored by the devastation, it was barely at cat 1! I bet you do! It was quite the experience that is for sure. This island has had it's share of natural disasters over the year...and then some! No question about it Andrea! We are never immune when mother nature is concerned. Thanks, no lives lost so that is what was most important. The damage and cost of the repairs were devastating though. Agreed! I am from CT originally so totally get those stereotypes. It is so heart warming to be shown the sense of communirty that forms when these things happen! Thanks! I will forever be grateful for the experience of it all. Truly renewed my faith in people at a time when I was losing that faith! Well we were very lucky. So many around us had it far worse. It was a deeply moving experience for sure. I feel very grateful to have been a part of it! Wow! We talked about it all night, how insane some hurricanes have been throughout the years. This one was barely a cat 1 when it hit us. I cannot even imagine what a stronger one would feel like, scary is a understatement! No noubt about it. It was a great experience for all of us really. Sad it had to brong so much damage but it was really restorative. A prequel to the needs of the community during the lava flow we have now. Mother nature in action, showing us small humans who is more powerful. Thank you for showing us a different side of Hawaii. No problem! Mother nature is certainly alive and well here on the Big Island! I like this post, it's very informative about all cruising options in Australia! I have done some short cruises and am intrigued with the Tasmania- Adelaide and Sydney to Queensland cruises. Cruising definitely gives you a different perspective of Australia! Aside from the all Australia cruise I think the one to Queensland is what I'd most like to do. But they all seem amazing! Mary the Whitsunday Islands are beautiful! So pristine. I'd add them to my list for sure when we return to the region. Thanks for the inspired share! Thanks! You should give it a go. They have discover dives so you can see how you like it before going through the whole certification. There most definitely is. There was destruction but humans can nearly always overcome that! Oh thats wonderful! It is at the very top of my Australia travel bucket list for sure. Australia has so many unique experiences, creating a bucket list is no easy feat. ... One of the best ways to see the area is by cruise ship where you can get up close to the rocky..